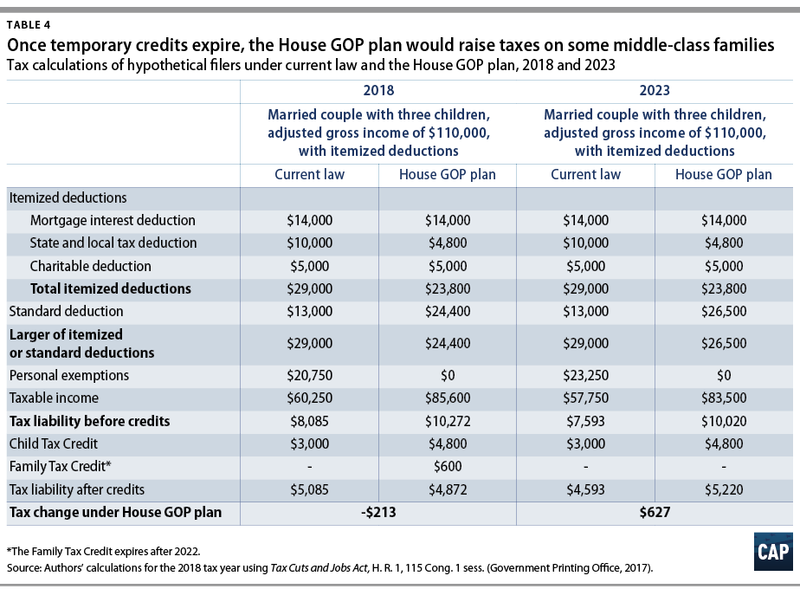 However, as this analysis shows, many middle-class and working families will see tax increases because the plan eliminates tax deductions and credits on which these families rely. Millionaires, on the other hand, would get huge tax cuts under this new plan. 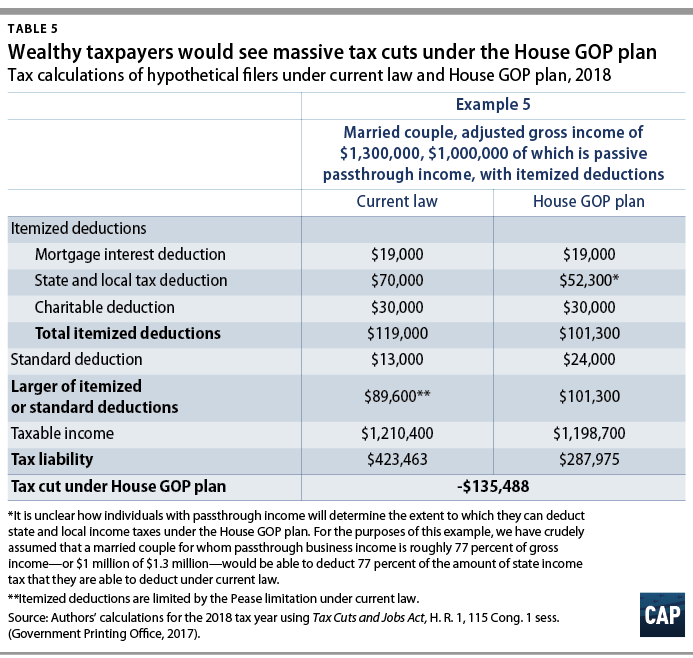 CAP compared the congressional tax plan’s effects on four hypothetical taxpayers who would see increased taxes from the plan, and one wealthy family who would see enormous tax cuts. One of the harshest ways that the House plan hurts middle-class families is by eliminating the medical expense deduction, which is used by millions of families each year. This means that in years when families face high medical bills that are not covered by health insurance, many will face dramatic increases in their federal tax bill compared to current law. Table 1 shows how this change would affect one illustrative family earning $95,000 annually whose child is diagnosed with brain cancer. Their child receives surgery costing the family $46,000 from an out-of-network surgeon. Under current law, the family can deduct this cost from their income. 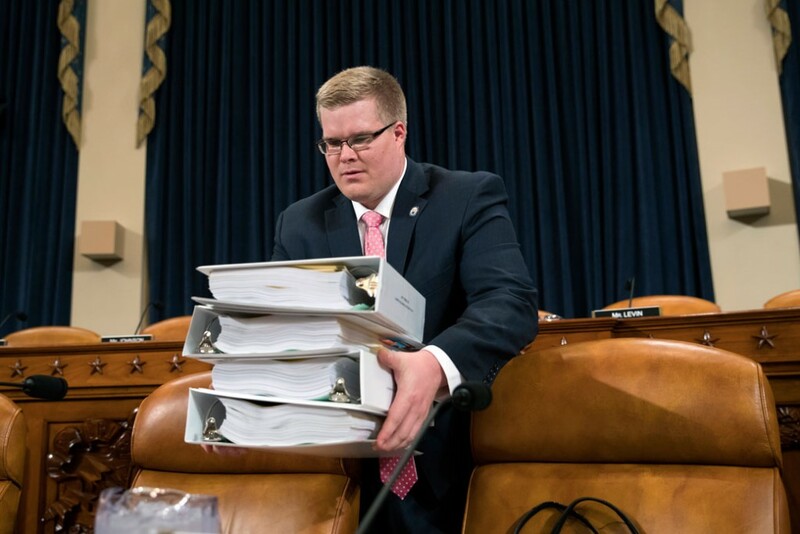 But under the House plan, the family would not be able to claim the medical expense deduction and would also lose the ability to deduct $16,600 in personal exemptions that reduce filers’ taxable income. As a result, even after the House plan’s larger child tax credit and temporary family credit are applied, the family would owe $2,839 more if this proposed plan became law. 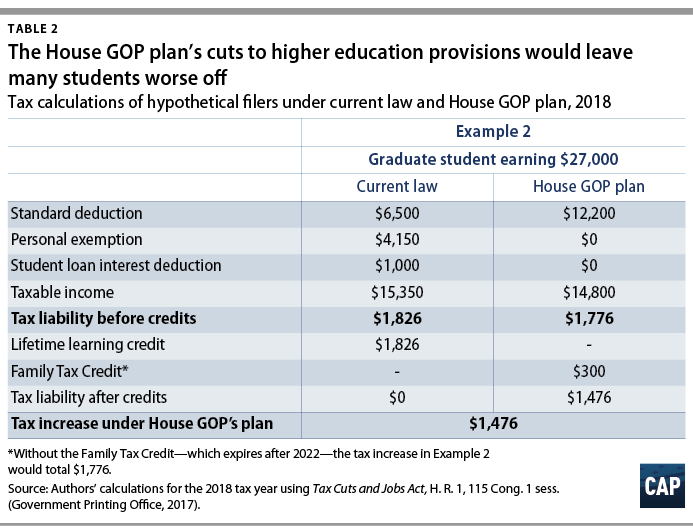 The House plan also cuts many higher education benefits from the tax code. While the bill’s proponents refer to these cuts as “simplification” and “reform,” in reality their plan cuts education benefits by about $65 billion over 10 years. Under the House proposal, taxpayers could no longer deduct student loan interest from their taxable income. Tuition reductions from institutions, such as those received by graduate students in return for teaching courses, would be treated as taxable income. Furthermore, the Lifetime Learning Credit, which provides up to $2000 a year at tax time to individuals in a broad range of education programs, including graduate school, part-time programs, and job training programs, would be eliminated. The bill does add an additional year of eligibility to the American Opportunity Tax Credit (AOTC), which can currently be claimed for up to four years to assist in paying for post-secondary degree or certificate programs. However, not all students qualify for the AOTC, including students who are enrolled less than half-time; the new fifth year expansion, moreover, only provides one-half of the value of the current AOTC. Table 2 shows how these changes could affect a current graduate student’s tax return. This filer is pursuing a master’s degree in education while continuing to work full-time. Under current law, she can deduct her $1,000 in student loan interest payments from her taxable income, a benefit she would lose under the GOP plan. Importantly, under current law, her $1,826 tax liability before credits would be completely eliminated by the Lifetime Learning Credit. Under the House GOP plan, this student would be unable to deduct her student loan interest or receive the Lifetime Learning Credit. Even after the House GOP’s temporary family credit is applied, she would owe $1,476 more if the GOP plan was enacted. House Speaker Paul Ryan (R-WI) claims of the House bill: “It is for the families who are out there living paycheck to paycheck.” This is certainly not the case. House majority leaders proudly tout that their plan increases the Child Tax Credit (CTC). But some of the families who are struggling the most would fail to see any benefit from the plan. Take a single parent working at just above the federal minimum wage, earning $16,000 annually while raising two children. Under current law, such a family lives below the federal poverty line and would not owe positive federal income taxes; the family would receive what is termed a refundable Earned Income Tax Credit (EITC) and a partially refundable Child Tax Credit. The House tax plan increases the CTC and makes higher-income families newly eligible for it—but it leaves out many poor families. Our illustrative family would see no increase in the CTC. And, in fact, they would see a slight decrease in their EITC of $12 because the Republican plan adjusts the EITC’s parameters using a different, and slower-adjusting measure of inflation, known as the chained Consumer Price Index (CPI). Other working families would see modest tax cuts next year under the House bill—but those tax cuts would fade over time and turn into tax increases. For example, Table 4 shows how the plan would affect the tax bill of a married couple earning $110,000 annually and raising three children. Under current law, this family itemizes their deductions: deducting $14,000 for their mortgage interest, $10,000 for state and local taxes, and $5,000 for their charitable donations. 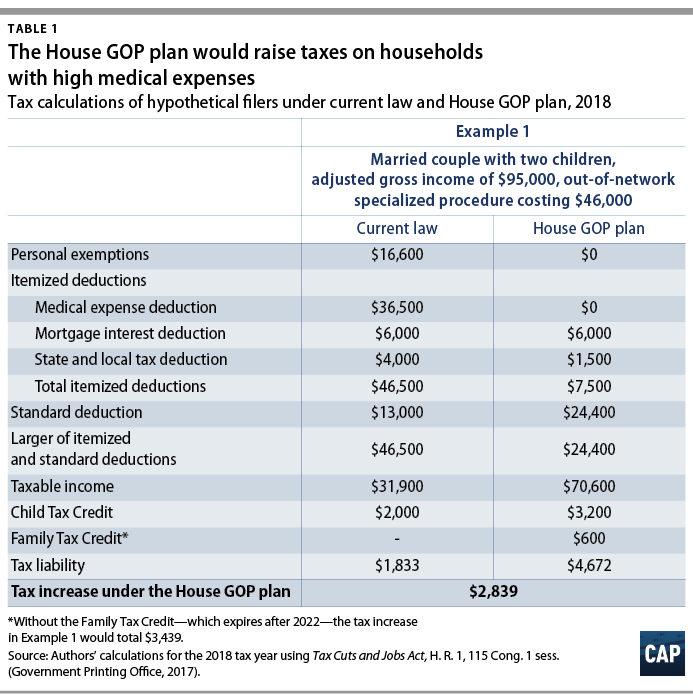 Under the House plan, this family would not itemize, as the House plan’s $24,400 standard deduction would be larger than their itemized deductions. The family would also lose personal exemptions worth $20,750 in 2018, due to their elimination under the House majority plan. 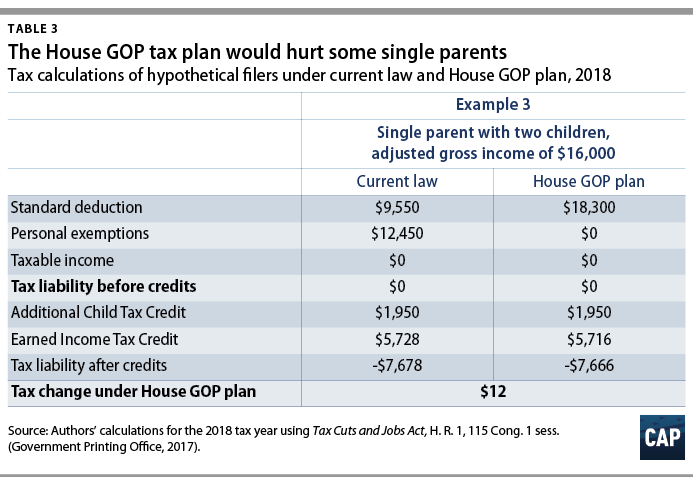 As a result of the temporary family flexibility tax credit, this family would see a $213 tax cut in 2018. However, the family flexibility credit expires after 2022 under the bill. Reduced tax rates and an increased CTC are not enough to make up the bill’s other changes. When also taking into account the tax-raising impact of moving to chained CPI inflation adjustments, this family would see their taxes rise by $627 in 2023, with the increases growing in subsequent years. While some lower- and middle-income families would see tax increases, the House majority plan would result in a tax windfall for rich households. Take for example a married couple earning $1,300,000 annually, $1 million of which is earned as passive, passthrough business income, which is taxed at a lower rate of 25 percent under the House tax plan. This means that despite the fact that the House tax plan includes a 39.6 percent tax rate on income higher than $1 million, these millionaires would completely avoid paying that rate. In fact, their top marginal tax rate would be 25 percent. Furthermore, under the House bill, this millionaire family would still be able to deduct the state and local income taxes they pay on their passthrough income while regular workers are denied the ability to deduct the state and local income taxes they pay on their wages. As a result, this millionaire family would see their tax liability drop by $135,488. In sum, the House majority’s tax plan primarily cuts taxes for the wealthiest Americans, not the middle class. The House majority’s plan also includes massive tax cuts for corporations, which primarily accrue to the wealthiest Americans that own corporate stock. House Republican leaders and President Donald Trump have claimed throughout this process that their plans are targeted towards helping middle-class Americans. As the examples in this column show, the House majority tax plan fails at this goal. Alex Rowell is a research associate for Economic Policy at American Progress. Seth Hanlon is a senior fellow for Economic Policy at American Progress.